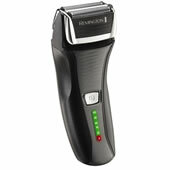 Remington have now discontinued this Electric shaver F5800 but the replacement foils and cutters are still available. With superior Triple Shave Technology, the Titanium-X scores a hat-trick with dual independently flexing foils and pivoting head for an ultra-close shave. Incorporating advanced Flex and Pivot Technology, the multi-directional pivoting neck freely adjusts to the individual angles and contours of your face and the difficult to reach neck and jawline areas. By maintaining permanent contact with your skin, it ensures an effortless and ultra comfortable shave, time after time.